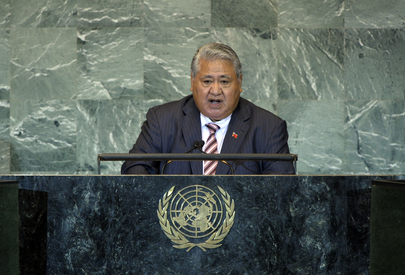 TUILAEPA SAILELE MALIELEGAOI, Prime Minister and Minister of Foreign Affairs of Samoa, recalling that his country had joined the United Nations 35 years ago from a belief in the sovereign equality of all nations, said the Secretary-General’s visit to the Pacific region was significant, as it had allowed him to see the scale of challenges faced by Pacific small island countries. The first ever visit to the region by an incumbent Secretary-General, it marked a milestone in the relationship between the Pacific and the Organization. Indeed, the United Nations was the world’s premier organization, whose role in various areas of development and improving the human condition must be exemplary. Its work to encourage Governments to uphold fundamental human rights was sorely needed. He urged the United Nations to play a more proactive role in helping the people of the Pacific to exercise their right to self-determination. A decade into the new millennium, full recovery of the global economy to pre-2008 levels was an elusive goal. The immediate to medium-term outlook was not promising, and while some Governments were being assisted with their budgetary difficulties, others were struggling to provide basic necessities. Noting that Samoa was both a least developed country and a small island developing State, he said that, despite the United Nations commitment to international development frameworks like the Brussels Programme of Action, the needs of those groups always outstripped available resources. Turning to non-communicable diseases, he said that, left unchecked, they would wreak havoc on the world’s economies, and he urged including their reduction in work to achieve the Millennium Development Goals. “These are real concerns,” he stressed, adding that sustainable economic development was a priority for Samoa and the Pacific island countries. He hoped that the Conference on Sustainable Development would allow for a reorientation of the United Nations community on the importance providing resources to implement the agreed programmes of action. The Pacific States had long been committed to efforts to conserve and manage fisheries, he said, and it had long been a point of frustration that vessels of major fishing nations fished illegally in Pacific waters. Thus, he urged cooperation from all nations with fishing fleets in the Pacific to work together to stop illegal, unreported and unregulated fishing practices. As for climate change, it was imperative that adequate resources were available and accessed through direct modalities to help countries meet their mitigation and adaptation programmes. Turning to peacekeeping, he said Samoa’s support for that work was underpinned by its contribution of police officers to peacekeeping operations in Sudan, Liberia and Timor-Leste. Welcoming South Sudan as the United Nations’ newest Member, he said that a year ago he had spoken of the hope that progress would come in the process to bring peace to the people of Israel and Palestine. The goal of a Palestinian nation living side by side with a secure Israel remained elusive. Direct negotiations must start. Solutions must be decided by the two parties and not imposed from the outside. Visionary leadership on both sides was needed. On terrorism, he said only by pooling resources and working collaboratively could countries defeat that menace. In closing, he said an expanded Security Council that mirrored present-day realities was essential, and he urged increases in the permanent and non-permanent categories of its membership.